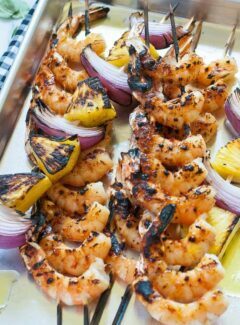 Yummy grilled shrimp kabobs with a spicy orange glaze is a perfect way to up your summer grilling game. 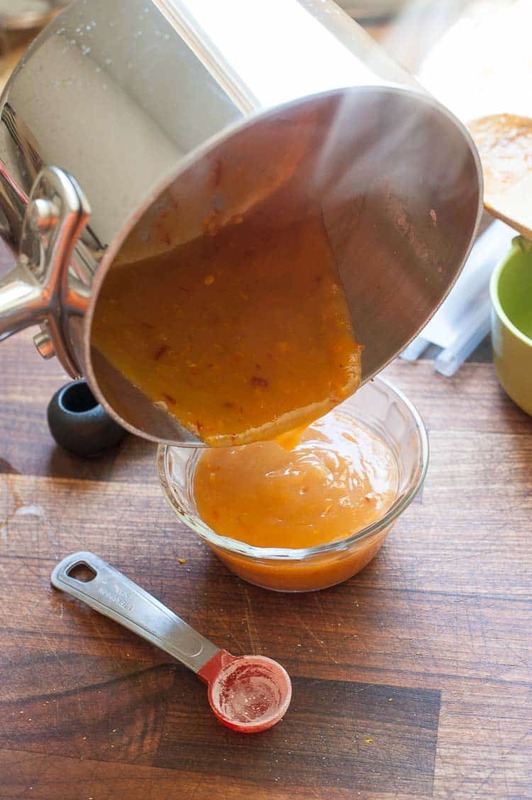 If you like shrimp like I do, you’ll love this chili garlic sauce reduced orange glaze. Reduced? Yep…because you start out with a cup of orange juice then add some chili garlic sauce, orange zest, brown sugar, and anchovy paste, then boil that liquid down to concentrate the liquid. Anchovy paste, because this is the stuff that adds plenty of umami which sparks the flavors of all the other ingredients. If you don’t have a tube of anchovy paste in your refrigerator, you need to get some. It ups the flavor of soups and sauces and you’ll never taste the anchovies. After the sauce has reduced after 6 or 8 minutes on the stove, mix some cornstarch in a little cold water and stir that in to further thicken the glaze. You’ll end up with 1/2 to 3/4 of a cup of the glaze to brush onto the shrimp. When you grill the shrimp, the charcoal doesn’t have to be screaming hot. Let it burn down so that you can put your hand over the grate for about 3 seconds before your hand is screaming hot. If you use a gas grill, just adjust to medium low and you should be good. The shrimp will take about 2 minutes on each side to turn pink, opaque and firm. If the glaze seems to burn, move the shrimp to a cooler part of the grill. I grilled some pineapple and red onions to go with the shrimp in a fruit and garden greens salad which I’ll tell you about next time…stay tuned. Now…get out there and start your grills. 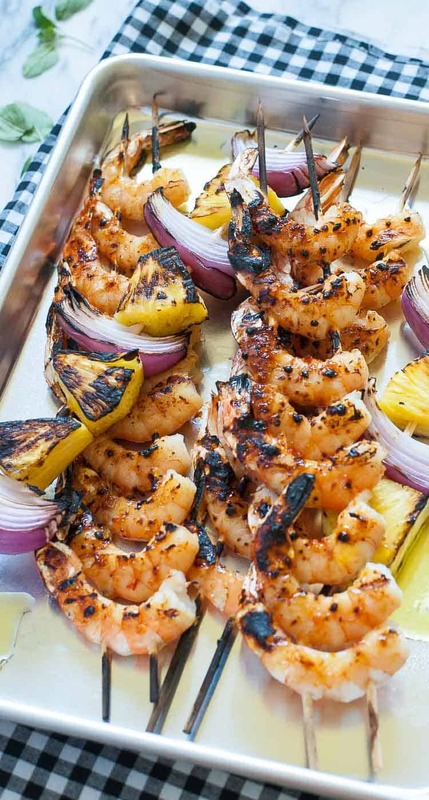 Make tasty grilled shrimp kabobs. Summer doesn’t last that long. This is an orange reduction glaze to spark up the flavor of grilled shrimp or perhaps even pork chops or chicken. Place the orange juice, zest, chili garlic sauce, brown sugar and anchovy paste into a small saucepan and bring to a boil. Stir to combine the ingredients and reduce the liquid by about half, 6 to 8 minutes. Stir in the dissolved cornstarch and let thicken, 15 to 30 seconds. Pour the glaze into a small bowl and allow to cool. Use metal or bamboos skewers which have been soaked in water for at least 30 minutes. String 8 to 10 shrimp onto each skewer. I used 2 bamboo skewers on each kabob to facilitate turning. 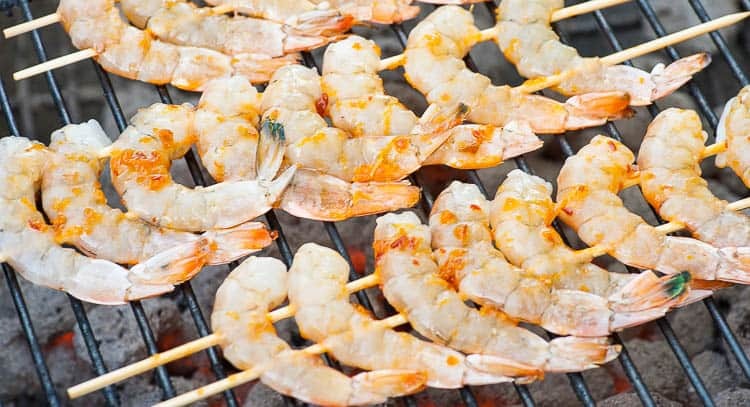 Brush one side of the shrimp with the glaze and place glazed side down on a medium hot grill, 1 1/2 to 2 minutes. Brush the second side with the glaze and turn. Grill for another 1 1/2 to 2 minutes until the shrimp is pink, opaque, and firm. If the glaze seems to burn, place the kabob on a cooler part of the grill. I calculate that 7 or 8 glazed shrimp would be around 110 calories. They would contain about 25 grams of protein. 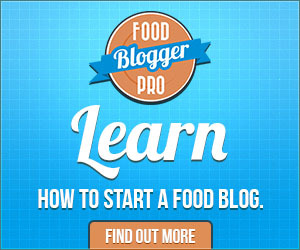 Disclaimer: This recipe post contains an affiliate link. If you purchase any product through this link, Joe’s Healthy Meals will receive a small commission. These are especially good with wild-caught shrimp. Fast, easy, and delicious.